CAP Group Ltd was founded in May 1962 and grew to be one of the foremost IT companies in the UK. It operated 4 divisions: Commercial; Financial; Industrial and Scientific across 14 locations throughout the UK. The Group became Europe's largest IT Services Company when it merged with French Systems House Sema-Metra to become Sema Group. 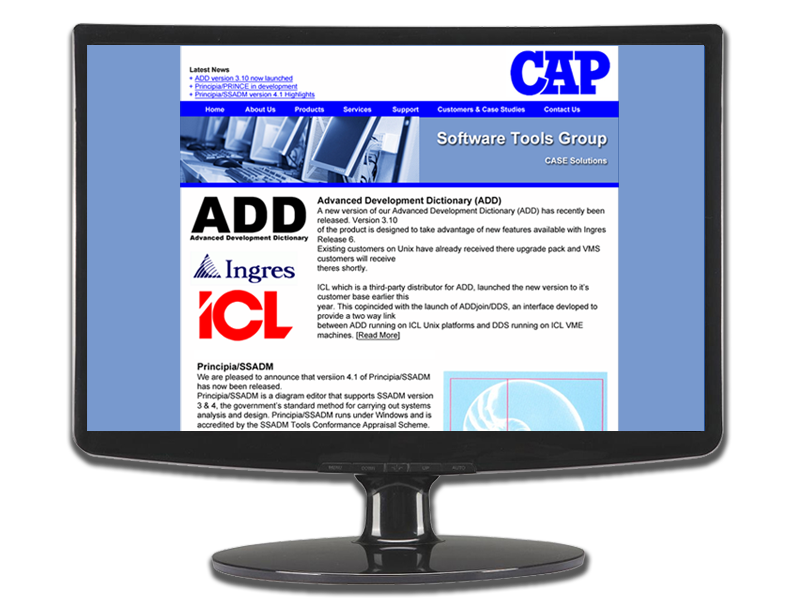 InForm developed a website for CAP's Software Tools Group (STG) to promote their range of CASE tools. The website was hand coded in HTML and was one of the first launched for this leading IT Services Company and for ourselves. The site went live in 1996 and even pre-dates Search Engines such as Google. Search Engine Optimisation hadn't even come in to being at the time and the technical headache was one of loading graphics quickly over slow dial-up modems.